Author branding: What really drives you? You need a “brand driver” for external and internal use; the short phrase that captures the essence of your idea. For example, take GE: “imagination at work.” This is important so employees know how to make decisions that align with the brand. FedEx is great example…what’s their promise to customers and to themselves? On-time delivery by 10:30 am. If you ever watched Castaway, remember the way that brand promise unified everything for everyone in the early scenes? And that last scene where he delivered the package: that’s delivering on the brand promise. So you can see, it is not a tagline, although it may sound like one and look like one, and your tagline may be derived from it. And you may think, “Hey, what I do is difficult and complex, and can’t all be captured in a simple phrase.” That’s probably true, and reducing all that complexity to its essence is no easy task. But think of it as a rallying point, a war cry. It may also be your unique selling proposition. What is the one thing about your work that, if you didn’t do it, the world could not become a better place? To come up with my own brand driver, I worked down to my basic personal belief that we are all part of a continuum of the spirit, that what is accomplished or not accomplished in one generation affects other generations both before and after. Maybe my telling of a specific story satisfies an unfulfilled need from long ago, and has the power to change a perspective even just a little bit. What we do, what we accomplish, and how we use our gifts is of great importance. I am an author of historical fiction. Therefore my brand driver is: Illuminate the past to inspire the present. Now, doesn’t it make you happy to have your brand driver in place? It is like discovering your purpose in life. The next step is thinking through your brand driver to the best possible conclusion. What would the world look like if you are wildly successful? For me, maybe the world would be a literate place where we would learn from and not repeat the mistakes of the past, so that things like greed-driven wars and preventable famines would not take place, etc. Let your imagination go on this one. Try to capture your perfect world in a sentence or two. But it is your vision, so if it takes a paragraph or a page, let the words flow. This is really about why your new-found purpose in life matters, and it does. You have defined your universe. Now let’s bring it down to boots on the ground. Your mission statement is about what you do every day in service of your brand driver towards achieving your new world vision. You are an author? Well then you write, of course. But think in terms of a business statement. A business exists to make money, and to make money you must have a product or service to deliver. Do you have long-term goals and projected outcomes? Your mission statement is partly definitive, partly aspirational. And don’t worry about getting it perfect. Just write something you are comfortable with based on what you have worked on so far. Your mission statement can change. Many businesses tweak their mission statement regularly to reflect current business conditions. GE’S MISSION IS TO INVENT THE NEXT INDUSTRIAL ERA, TO BUILD, MOVE, POWER AND CURE THE WORLD. GE imagines things others don’t, builds things others can’t and delivers outcomes that make the world work better. GE brings together the physical and digital worlds in ways no other company can. In its labs and factories and on the ground with customers, GE is inventing the next industrial era to move, power, build and cure the world. See how that might inspire customers? Easy, right? Now write yours exactly like that only different. (JUST KIDDING!) Your aspirations may not be quite that lofty, but your mission statement should include a reference to your vision and how what you do will help achieve it. Note GE’s reference to labs, factories and customer contact. Still need inspiration? Here’s a blog post that lists 50 mission statements for non-profits, and a few more from another site that show longer statements and a variety of business types. Keep in mind your mission statement is something you might post on your website to tell your customers in a general way who you are and what you do, so think about it from the reader perspective and go for clarity over cleverness. To develop your positioning statement, I refer you back to my Royal Branding series, part 4 on Queen Elizabeth. Elizabeth’s life was at stake so it is understandable that she would need strong positioning in the minds of her subjects, but why do you need a positioning statement? If you are an author, just go to a bookstore like Barnes and Noble and look around. If you are like me you will quickly be overwhelmed with the vast number of books out there and wonder why you even bother writing at all. Then get out of there fast and remember your brand driver and your mission. You are one of a kind. No one else has the same story and no one else can tell it the way you do. But where do you fit in the marketplace, and how will you explain it quickly to the literary agent or the customer standing next to you in the elevator? To create a good positioning statement you should (1) define your target audience, (2) include the category or genre in which you operate, (3) articulate the benefit or unique qualities being offered and (4) give customers a reason to believe you will deliver on your promise. You’ve already done most of the footwork on this one. What we are doing now is packaging it in a way that brings in your marketing strategy and how you want your audience/customers to perceive your brand in relation to all the others. Whew! That is a lot to think about already. Since this post is now getting a bit long, I will come back next week to finish this series with Taglines, Marks and Colors. And after all that brain work, maybe it’s time for some escape reading? 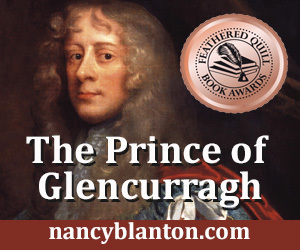 Sharavogue is an award- winning novel of 17th century Ireland and the West Indies. It is both historical fiction and fast-paced adventure. You can purchase Sharavogue at amazon.com, barnesandnoble.com, and most online booksellers. Visit my website at www.sharavogue.com for more information. And please follow this blog for research updates and announcements. I'll be posting a new series soon about my on-the-ground research in Ireland for my upcoming book, a prequel to Sharavogue.